A new area for me, and only 4 miles from home. An ancient Beech and Oak wood surrounded by harvested coniferous plantation. Based on what I found today, I'll be visiting here quite regularly. The wood is called 'Steeple'. This should set the scene. Beech and Oak, with Willows, Alder and Sycamore at the fringes. Plenty of stumps for fungi later in the year. The ground is covered in Greater Woodrush and Bluebells. Mosses and lichens everywhere. 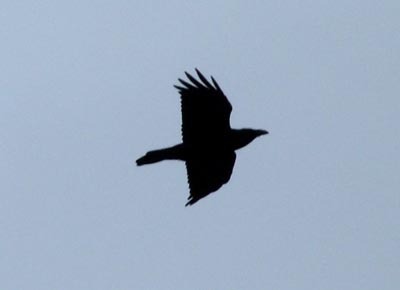 This Raven was circling overhead, which is unusual. They're usually quite wary and flee if you point anything at them. It was croaking in the usual deep voice, and was being answered by another in the trees. 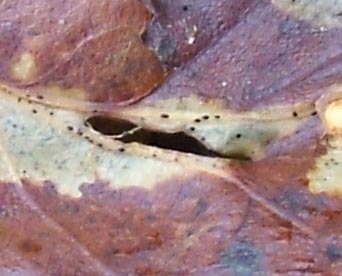 I found this Oak leaf with what appears to be a pale fungus in patches. The right hand picture shows a close-up of what appear to be sporing structures. Last year - August 1st - I showed Rhyssa persuasoria, an Ichneumon Wasp which is parasitic on Wood Wasps. I think I now know where to look for some later in the year. Two shots from Willows: A breaking bud on the left and an opening catkin on the right. A nice close-up of the Ash buds. They always remind me of the hoofs of prehistoric horses (Eohippus, I think).